The Castello di Bossi estate is located in the beautiful Tuscan town of Castelnuovo Berardenga. Evidence shows that this land was once a Roman settlement. In the last 10 years the company has added two properties to the estate holdings: Renieri in Montalcino and Terre Talamo in Morellino di Sansano. The Renieri Tenuta, or winery estate, comprises 128 hectares in the southern quadrant of Montalcino, on slopes that face Monte Amiata. Thirty hectares of vineyards are planted at an elevation of 350-420 metres, their exposures forming an arc from southeast to southwest. 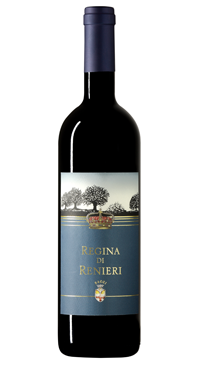 Regina di Renieri is an elegant IGT Rosso Toscana made from 100% Syrah grapes that grow on yellow and red clay soil at an elevation of 360 meters above sea level in the ideal south / south east exposure. The grapes are hand harvested and maceration occurs for 26 days to extract lots of colour and structure. The wine ages for 18 months in barriques and 12 in bottle.